Craving a cozy potato soup recipe? 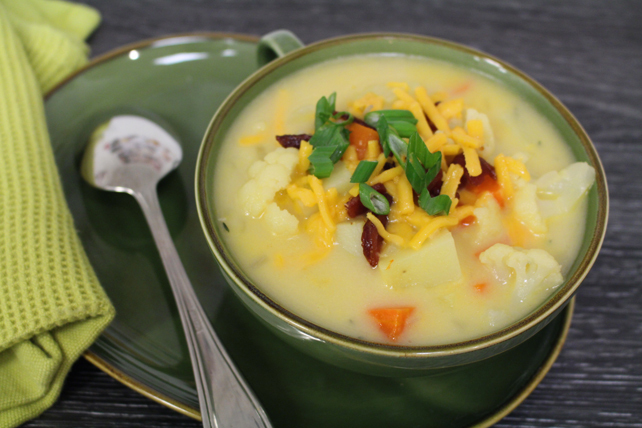 Our Cheesy Cauliflower Potato Chowder recipe to the rescue! Cheddar cheese and bacon put this chowder over the top. Cook and stir bacon in large skillet on medium-high heat 5 min. or until crisp. Remove bacon from skillet with slotted spoon; drain on paper towels. Add yellow onions and garlic to drippings in skillet; cook on medium heat 5 min. or until tender, stirring occasionally. Stir in flour; cook 1 min., stirring constantly. Add broth, cauliflower, potatoes, carrots and thyme; stir. Bring to boil; simmer on medium-low heat 20 min. or until vegetables are tender, stirring occasionally. Remove and discard thyme sprigs. Add milk to soup; cook and stir on medium-low heat 3 min. or until heated through. Add 1 cup cheese; cook and stir 1 min. or until melted. Serve topped with remaining cheese, green onions and bacon. Serve with crusty whole grain bread slices. Garnish with 2 Tbsp. chopped fresh parsley or basil before serving.